Today I am dredging up a review from The Listener from November 28, 1946. In the "New Novels" column, Henry Reed considers two books which are distinctly post-war: Arthur Koestler's Thieves in the Night, based on Koestler's experiences setting up a kibbutz in British-ruled Palestine; and Henry Green's Back, regarding a wounded British soldier returning from a German POW camp. Reed also has a few favorable words for Tom Hopkinson's Mist in the Tagus, "a story of two heterosexual girls in love with two non-heterosexual young men." Thieves in the Night. By Arthur Koestler. Macmillan. 10s. 6d. Back. By Henry Green. Hogarth Press. 8s. 6d. Mist in the Tagus. By Tom Hopkinson. Hogarth Press. 7s. 6d. In almost every way, Mr. Arthur Koestler's new novel is profoundly depressing. It depresses one on his behalf because he has suffered what he describes; on behalf of the Jews he writes about because a solution to their problems seems almost unimaginable; and on behalf of the readers who normally admire his work because Thieves in the Night is a poor book. Mr. Koestler seems indeed to be not very interested in making it any better, and I felt while reading it that the contempt he appears to feel for most groups of people had somehow invaded his attitude towards novel-writing, and — less pardonably — his attitude towards his readers. We are homesick for a Canaan which was never truly ours. . . . Defeated and bruised, we turn back towards the point in space from which the hunt started. It is the return from delirium to normality and its limitations. A country is the shadow which a nation throws, and for two thousand years we were a nation without a shadow. Mr. Koestler has summed up the tragedy in that unforgettable last image; and it is obvious that his subject is a great one. It is here that one's cause for depression rises: rarely can such a subject have been so dully and so mechanically treated. We are given many illuminating facts; but during scarcely more than a dozen pages does the book come alive as an original story; these are page after page of discussion, of would-be satirical portraiture which I feel any novelist anxious to do a good job would have seen to be commonplace and flat. No readers enjoy more than do English readers satire about themselves abroad; but A Passage to India, to say nothing of other books, has set a standard in this sort of writing which one cannot ignore. And, alas, Mr. Koestler tends more and more to become a publicist. He is perhaps not to be blamed. It is an easy line, and doubtless it is justifiable. I can imagine that tolling in his ears is the death-knell of civilisation. Art seems increasingly crowded on to a narrowing littoral and facing an incoming sea. I think a critic is called upon to understand and sympathise with this point of view; he is also called upon to say that straight polemical writing is more readable than the casual dramatisation found in Thieves in the Night. It seems idle to suggest that, with his gifts, Mr. Koestler could have developed his characters to a point where they become interesting, and cease to be merely a set of wooden objects asking the reader for pity. We know that if Mr. Koestler cared to try, he could force the pity from us. We know that he could also make us laugh, but here, as in his play, 'Twilight Bar', he prefers facetiousness. The solemn importance of the subject prevents one from ignoring the book; but it is a great disappointment. So many intelligent novelists in recent years have eschewed the use of plot and substituted what may be charitably called 'theme' that the sight of sort of plot emerging from a novel goes to a reviewer's head. The position is much the same with wines. Years of tormenting abstinence deaden one's judgment. Plots and wines return, and at first it seems in both cases that any blessed thing will do. The excitement of wanting to know what will happen next leads one to murmur preliminary words of extravagant praise. Then the plot falters, the wine doesn't turn out as well as you expect, and your words of praise have to be withdrawn. Thus with Mr. Henry Green's new novel, Back. It starts an attractive story about a man named Charles Summers returning with a peg leg from a prison camp; Rose, his former mistress, the wife of a friend, has died. By a curious contrivance Charley is introduced to her illegitimate half-sister, Nancy; he cannot believe she is not Rose herself with her hair dyed. It is part of the nightmare quality of being 'back'. I do not object to an improbable plot. But Mr. Green's plot totters; it too is peg-legged and has to have a long rest in the middle. Its end is convincing and beautiful, but by the time it comes we have slightly lost interest. If you know Mr. Green's other novels, its curt title will suggest to you at once that he has chosen a good 'theme' for himself; there is the intensity of feeling found in Caught and Loving. The ideas that he implies in his titles are for him poetic ideas, as summer or winter might be to a poet. It is this that makes Mr. Green one of the most striking and original of modern novelists. To me he seems also one of the best. He does something new and good. I can see that his curious style may be an irritation to some readers; me it normally charms. Adaptations of highly mannered authors are always dangerous; but Mr. Green seems to find genuine kinship with the sad, wistful mood of the earlier Bloom chapters in Ulysses. His echoing poetic images, recurring and transformed like musical phrases, are to him a natural and not an artificial way of seeing and feeling; and they reproduce something real in our own sensitivity. His new novel contains ay fine passages; its comedy is excellent. If it is less of a success than its two immediate predecessors, it is nevertheless something one will keep with Mr. Green's other books and take down from time to time. Mr. Tom Hopkinson's second novel, Mist in the Tagus, has a fault staggeringly unusual in contemporary novels: it ought to have been longer. The people and emotion he deals with demand greater space for their proper emergence than he has allotted them, so that relationships which should have been dramatised are often merely described: there is a felling that some of them have been unduly potted. It is a story of two heterosexual girls in love with two non-heterosexual young men. It occupies the week or fortnight of an English girl's holiday intrusion into a leisured small group of people who have drifted down from Europe into Portugal. The feeling of rapidly shortening time as the girls attempt to accomplish their desires is excellently achieved; so is the sense of inevitable failure which pervades their efforts. Everything in the book is well conceived and well ordered; the actual succession of events and disclosures shows a most intelligent and perceptive writer at work. But the final feeling one is left with is that one has seen it all through the wrong end of a telescope. Today this seems like being given an ounce of best butter in place of a pound of common marge. One hardly knows whether to be grateful or not; it is another aspect on the plot and wine situation referred to above. 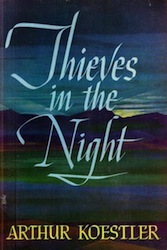 You can read the original New York Times review for Thieves in the Night on their website.